Ellie Sandall loved creating pictures from a very young age and has a passion for children’s books. (She’s always running out of space for her expanding collection!) After spending much of her time at school doodling covertly on the last pages of her exercise books, she went off to do a degree in graphic design at Bath Spa University, followed by a Master’s degree in children’s book illustration at Cambridge School of Art. 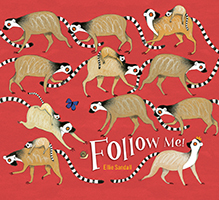 Lemurs follow the leader into—and out of—trouble in this simple, engaging picture book that children will love playing along with! Wide-eyed lemurs follow, follow, follow their king across a colorful landscape, as they find things to chew, things to munch, and things to have for their lunch; things to hunt, things to chase, things to scare, and things to race. After narrowly escaping a crocodile (and becoming someone else’s lunch) the lemurs settle down for a well-deserved nap. Zzzzzzzzzzzzzzzzzz.